Extract and Convert Microsoft Outlook Email: How to Save Time Managing Your Outlook Email with MessageExport. How to Save Time Managing Your Outlook Email with MessageExport. Microsoft Office Outlook is a great way to manage your emails on Windows. But wouldn't Outlook be even better if you could easily convert emails to PDF and other formats, and then automatically copy them to a folder? If you work with Outlook emails, you have to try MessageExport! It's an Outlook add-in that will save you time and make you more productive. MessageExport is free to try! Use it for 15 days. MessageExport installs as an add-in for Microsoft Office Outlook on Windows. You'll notice it in the Outlook toolbar. To use MessageExport, just select the emails in Outlook mail list that you want to convert. MessageExport add-on installed in Outlook 2016 toolbar. Next, choose an export operation from the dropdown list, and then click "Export." MessageExport can convert one email message, or thousands of email messages to PDF and many other formats. 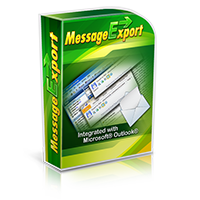 Download your free trial of MessageExport today!